Halloween's origins, could they have been Christian? In this "The Truth Will Set You Free" TWave Radio episode, Pastor Vic Batista of Calvary Chapel Aventura located in the Miami, Florida area and I will look at whether Christians should participate in Halloween. Vic Batista: We are going to dive into a subject matter that is very important, and that is the dangers of Halloween. What's incredible to me is how many people really don't understand what Halloween is all about. 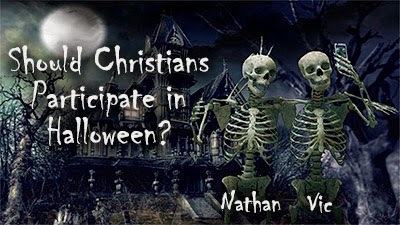 Many Christians are not really well versed in what happens during Halloween. Often times people think that it is just an innocent holiday full of candy and scary thrills, so especially Christians really need to learn what Halloween is all about. Nathan Jones: Halloween like many holidays has been hijacked. It started out that Halloween was All Saint's Day, or the Eve of All Saints Day, or All Hallows, or the Solemnity of All Saint's, or the Feast of All Saint's. It was actually started by the Catholic Church and the Eastern Orthodox Church to honor the Saints and to honor those who have died who believed in Jesus Christ as their Savior. I'm sure there has always been a dark part to Halloween due to putting candles on graves. That's kind of spooky and seemingly evil, which wasn't the case at the time. But, unfortunately, the Satanic Churches and many other cultic groups have hijacked Halloween and turned it into the worship of evil. Vic Batista: Nathan, that's a good point. I like the word that you used, and Halloween has been "hijacked." We find that there are certain holidays today that are being hijacked in certain ways contrary to their original intent. They've changed so much so that what we see now isn't anything that lines up with the Bible and Evangelical Christianity. You make a good point in that it's how we use a holiday that matters. Pastor Chuck Smith and Caryl Matrisciana, which you know her very well as she's a friend of Lamb & Lion Ministries, they produced an incredible video called Pagan Invasion. Nathan, what they say is exactly like you mentioned in that here we have these celebrations, and some of them started out with very good Christian origins, but all of a sudden it changes. I think it is because we are living in the end times. Nathan Jones: Yes, I agree. Anything that is Christian, Satan is going to try to water down. He's going to change the message. He's going to try to distract us. Of course, there are those who are non-Christians who want to celebrate Christian holidays as well. I remember a Hindu friend of mine who had a Christmas tree and celebrated Christmas. I remember asking him, "Why are you celebrating Christmas? You have a 300 million gods and all, so why Christmas?" He replied, "Because it is a holiday and that's when we share gifts. Gifts are all it is about for me." And so, different people see the holidays with different meanings. Unfortunately, these holidays end up getting pulled away from the Christian meaning and end up becoming secular if not pagan in meaning. Vic Batista: That's why I believe that we need to pray a lot during this supposed celebrations. My family personally has decided not to entertain Halloween because I'm originally from the Dominican Republic, and when we came to this country we started to recognize a lot of things that we didn't celebrate in our country. In our country, we did have a sort of celebration called Vale Chunez, which is similar to Halloween. It's where people dress up with different masks. In my birth country there is a lot of voodoo and witchcraft, and those practices are very dark. When we came to the United States, we noticed Halloween and we recognized that it was a similar type of celebration than Vale Chunez, but it was no longer an innocent type of thing. We started to see a dark side to it due to our familiarity with the occult. My kids are too old as I learned this year to participate in Halloween. They definitely did not enjoy going to a fall festival as they were too old for all the games. So. Halloween pretty much done for my family. I enjoyed taking my kids out to fall festivals when they were little. There's a lot of wonder to this time of year. So, for me growing up, I didn't see the pagan element. "It was actually started by the Catholic Church..."
I agree with your first sentiment. ...I do not consider Catholic traditiona Christian at all. ... but the evil and darkness of this day. : I've deemed it sinful in my convictions.... but me solely. .I don't think it is an essential Christian doctrine. .therefore do what you want and ask the Holy Spirit for guidance through the scriptures.